Landscape light poles provide beauty to outdoor settings. Provide lighting to your garden, walkway or landscaping. 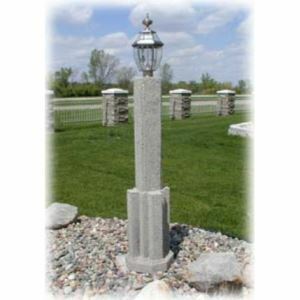 Precast concrete light post is steel-reinforced, and built to meet or exceed any industry standard for strength and durability. Also, all of our products are available in a wide variety of aggregate textures and colors to put that finishing touch on your project. Our light post does not include the light, but will accept almost all light fixtures. Dimensions 14" x 14" x 63"